Bali. The destination seems to evoke the traveler’s image of a paradise. Yes, and with good reason. On the island where author Elizabeth Gilbert (Eat, Pray, Love) found her love, there is certainly much to love; the landscapes, the culture, the jungle, the beaches, and yes the sunsets. On the west coast of Bali, where the sea surrounds the Tanah Lot Hindu temple (at high tide) people gather to watch something special, something spiritual. Many walk along the rocky coastline and the black sand beaches while others stay perched upon the cliff at local Pan Pacific Nirwana Bali Resort (formerly the Le Meriden Hotel). But whatever people decide, all prepare with the same anticipation for the sunset behind the Hindu Temple on the Indian Ocean. With two nights, I did both. The image below, my first night (perched on a cliff) was an afternoon spent sipping a cocktail and savoring the special moment. 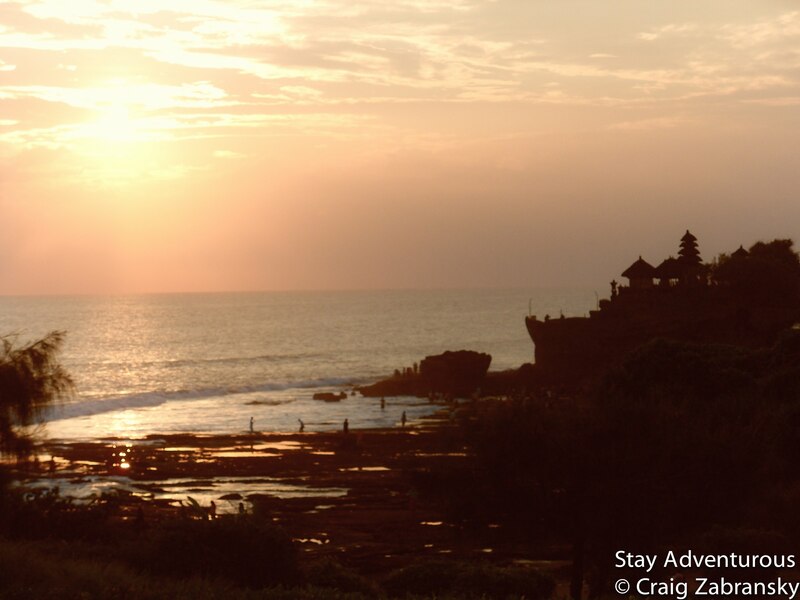 Enjoying some of the true beauty of Bali – its Sunsets. Happy Sunset Sunday. The sunset is always special, magical and memorable, but this sunset made the 2015 Sunset Sunday Calendar to remind us that each sunset is also spiritual. I’m becoming addicted to your sunset Sundays. I, too, love photographing sunsets and captured a fabulous one in Mazatlan. I’ll show you someday. Terri, glad to learn of your addiction, there is no 12 step cure, nor do I think do we need one… I hope you continue to enjoy these sunset posts and your sunset memories. I look forward to seeing the Mazatlan shot. Interesting article and great picture. I just started to read Elizabeth Gilbert’s book. I hope some day to visit Bali and experience the beauty of the island. A dream vacation and definitely on my bucket list. First of all, congrats with your new design launched. Secondly beautiful shot again!